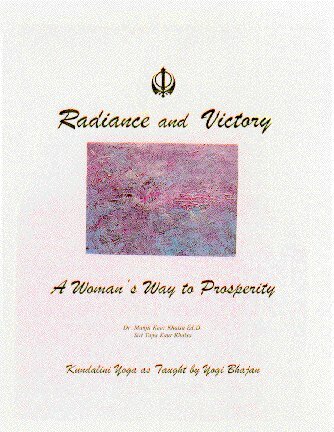 This book describes a spiritual approach to prosperity. It`s a practical handbook filled with beautiful yoga sets and wonderful meditations as taught by Yogi Bhajan, a Master of Kundalini Yoga.Everyone has the birthright of prosperity and happiness. The yogic techniques in Radiance and Victory develop the attributes of persistence, progression and projection that can lead to the realization of that birthright. Though oriented towards women, many of these yoga sets and meditations can be used by both women and men. Learn how to create prosperity in your own life.